1. 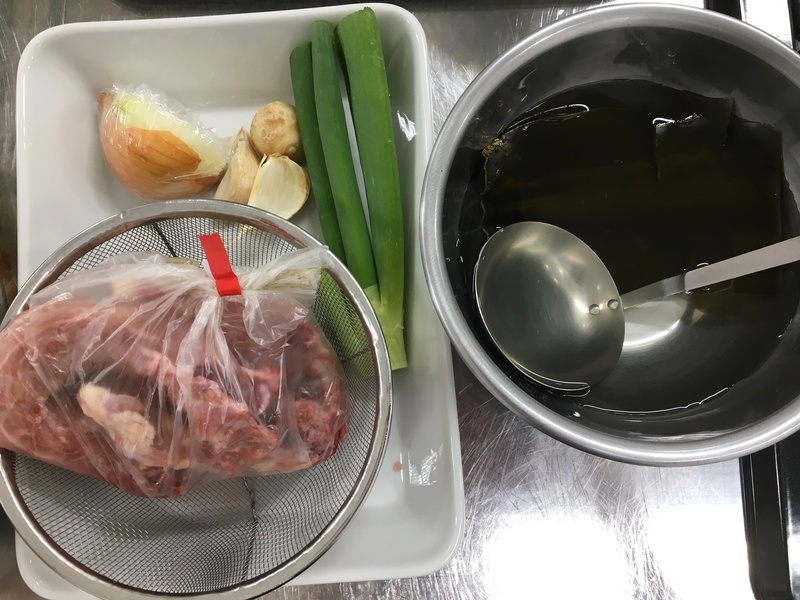 Make the konbu water broth. Add the water to a container, put the konbu in, and set the container aside for at least 1 hour. You could even do this the day before, but put the container into a refrigerator. 2. 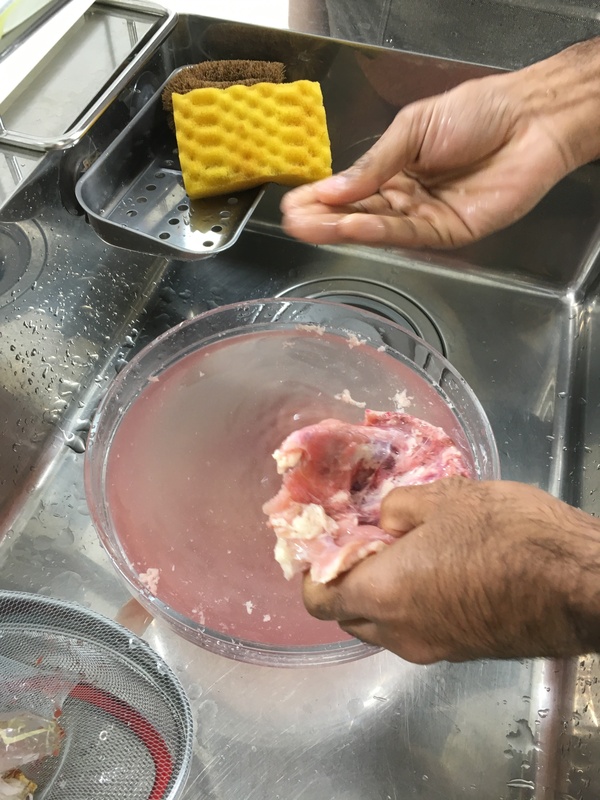 Rinse the chicken bones well under running water. Remove any blood remaining on the bones. Bring water to a boil in a medium-to-large-sized pot. Add the chicken bones. When the water comes to a boil once again, turn off the heat and discard the water. Rinse the bones and let them drain. 3. Cut the chicken bones into a few large pieces. 4. 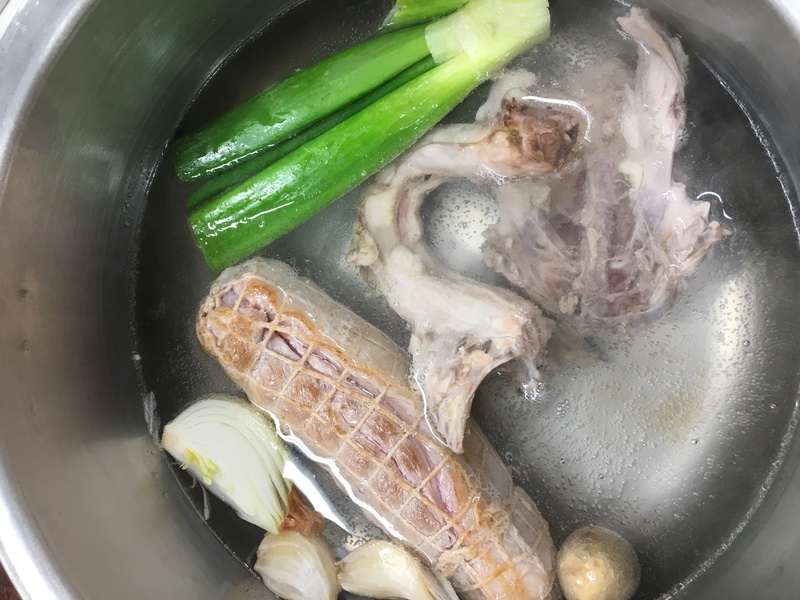 To a pot, add 2 l of water, the chicken bones, and the green onion, onion, ginger, and garlic. Bring the pot to a boil and skim off any foam that develops on the surface. 5. Bind the pork roast with kite string and sprinkle salt on the surface of the pork. Put a frying pan on medium heat and brown the pork. 6. Add the browned pork to the pot with the chicken bones and simmer the open pot over low heat for about 1 1/2 hours. As the water level falls, replace the lost water with konbu water broth. 7. Prepare the chāshū sauce. Add the soy sauce, sake, and cane sugar to a small pot. Bring the pot to a boil and then turn off the heat. 8. At the end of an hour and a half, remove the chāshū to the pot containing the chāshū sauce. Filter the broth into a second pot. Do this with a sieve lined with a thick paper towel. 9. Let the chāshū soak in the chāshū sauce for at least 15 minutes. 10. When the pork has cooled, slice it into pieces about ７ mm thick. Retain the chāshū sauce. 11. Add oyster sauce and vinegar to the pot with the chāshū sauce, and mix well. This is your ramen sauce. 1. Chop the white leeks into small pieces. 2. Fill a large mixing bowl with water and place it in the sink. Fill a large pot with water and bring it to a boil. Add a pinch of salt (not included in the ingredients). Hold the spinach in a bunch. Put the root ends into the boiling water and hold them in that position for 30 seconds. Next, put the rest of the spinach into the boiling water as well. Boil for an additional 30 seconds, then remove the spinach to the bowl of water. Gather up the spinach so that you are holding all the root ends together. Firmly squeeze the spinach to rid it of excess water. Cut spinach into 4-cm lengths. 3. Put the ramen noodles into a mixing bowl and loosen them up with your hands. Fill a large pot with water (about 1 liter per serving) and place it on high heat. 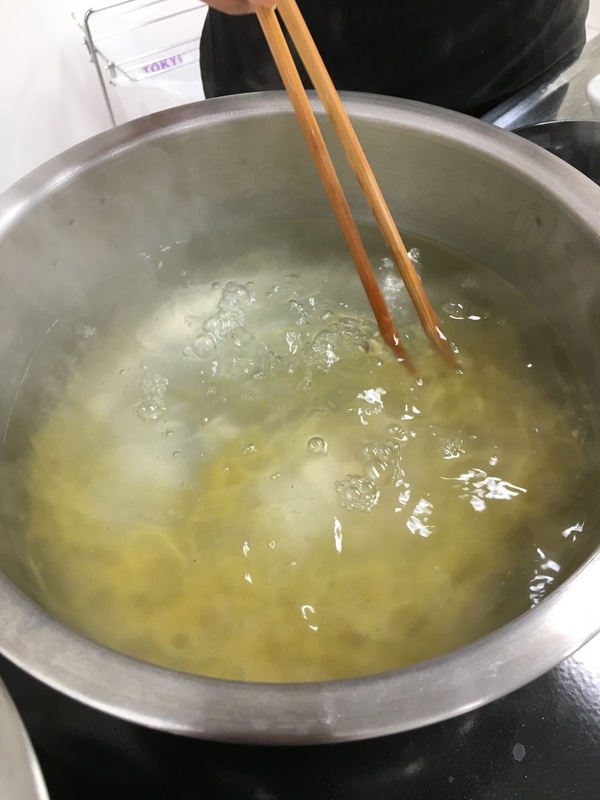 When the pot comes to a boil, add the noodles and boil for 2 to 2 1/2 minutes, depending on how hard/soft you prefer your noodles. 4. Add 1 1/2 tbsp of ramen sauce to each of the serving bowls. 5. Add 500 ml of ramen broth to each of the bowls. 6. Add 1 serving of noodles to each bowl. 7. Add 4 slices of chāshū to each bowl. Cut the boiled eggs in half and place two halves in each bowl. Top each bowl with nori, spinach, and white leeks. 8. Add white pepper to taste.